Only three of these peak do not have an official name. Some county high points are merely waypoints on a rise to a higher summit in another county, every point on this list is a peak, and all of them have >300 feet of prominence (though some not by much). The county boundaries I used came from a repository used by Google, so they may not be as precise as needed to get a truly accurate list. The list includes some more iconic mountains in place of less iconic high points. In my home county of Ada, the most prominent peak is Shaw Mountain, but the high point is the Boise ridge south summit. For Camas county, the most prominent peak is highly visible Smoky Dome instead of the summit just south of Bromaghin. 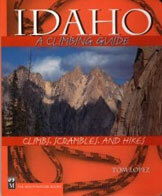 The list It includes all of Idaho’s ultra-prominent peaks. Some truly iconic Idaho summits, like Bell Mountain, are not present in the prominence list, while they do appear in the high point list. Likewise, the most prominent mountain in Boise county seems to be Shafer Butte, even though high point Mount Cramer is a much better representative of the Boise county mountain experience. Two of the peaks, the ones in Canyon and Lewis counties, are located on private property and access is unknown. Corrections for any errors are also quite welcome! Canyon – Walters Butte (2938, 464) —Private Property. Lewis – Peak 3460 (Greer Hill) (3469. 450) —Private Property.